Deadwood: Are the Two Wrap-up Movies Dead? 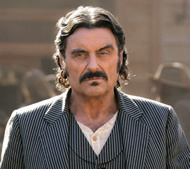 Last May, it was leaked that HBO would not be renewing the Deadwood series for a fourth season. It looked like the rough language western series was headed into the sunset until fans caught wind of the idea. They put together a major campaign that flooded HBO with letters, petitions and angry calls. They even took out a full-page ad in the Hollywood trade-paper Variety indicating that they would be cancelling their HBO subscriptions if Deadwood didn’t return. Shortly thereafter, Deadwood creator David Milch and HBO worked out a deal for a pair of two-hour movies that would resolve the series’ storylines. At the time, it was expected that the movies would air in 2007. In January, it was said that Milch was excited about his script ideas and production was expected to start shooting in June or July. That hasn’t happened and to date none of the series’ actors have indicated that they’ve been signed to the project. But, HBO is committed to making them eventually, right? Though HBO once placated outraged viewers with the movie plans, they hardly seem to be a priority any longer. When asked about the chances of the Deadwood films being made, sadly HBO Co-President Richard Plepler puts the odds at only “50-50.” Stay tuned! 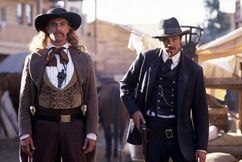 Deadwood: What Happened to the HBO Movies? Deadwood: Heading into the Sunset? Thanks a lot, HBO. You screwed up one of the very best television shows with that lame, poorly written finale script. Anti-climax would be a compliment. This ending was a beginning. All questions, no resolution what so ever. Don’t get the fans wrong. We don’t want a tidy, sewn up tight script, but this last show was insulting. Shame, shame on you. That city, those characters, deserved better treatment.